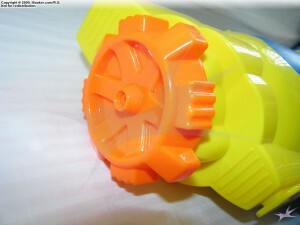 The Water Warriors Equalizer was released by Buzz Bee Toys Inc. in 2009 and was the smallest of a new layout of Water Warriors-brand water blaster. Its larger brethren are the Water Warriors Renegade and Water Warriors Vindicator. The Equalizer subsequently evolved into the Water Warriors Outlaw (2013) which can still be found on store shelves at the time this article is being written. 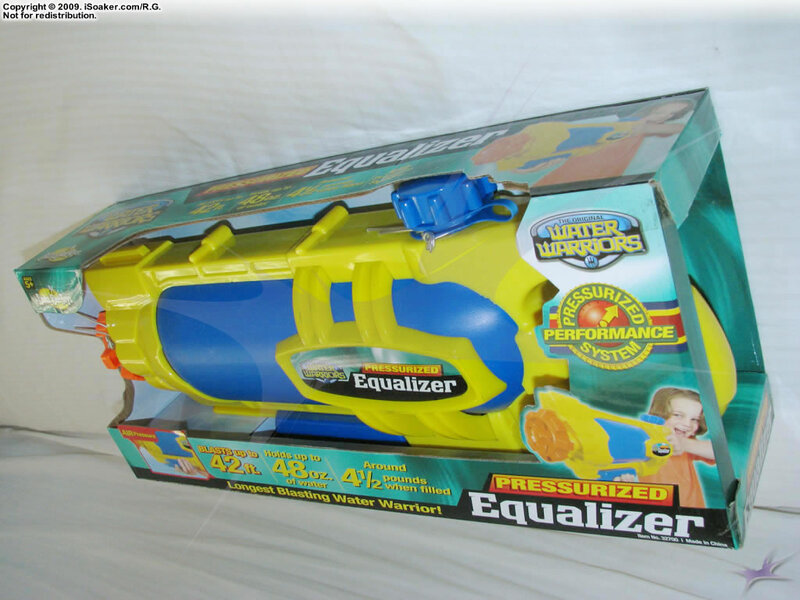 The Equalizer is also one of my all-time favourite water blasters. Let’s explore why. One of the first thing ones sees when spotting the Water Warriors Equalizer on a shelf is its large, blue reservoir. In fact, in the older, original packaging, much of the rest of the water blaster is partially obscured by the box. The nozzle area is visible, but the bottom-mounted pump is hidden. The newer packaging found for the Water Warriors Outlaw opens things up significantly more. 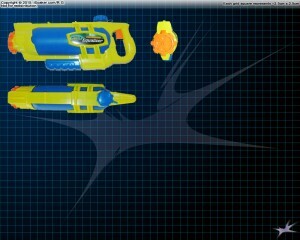 The second thing one notices is how short this water blaster is. 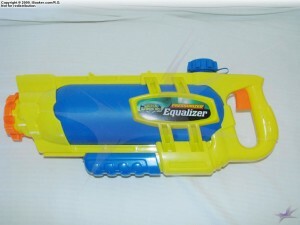 Particularly if seen placed beside a standard-layout water blaster, the Equalizer lacks the bottom-located trigger-grip region. 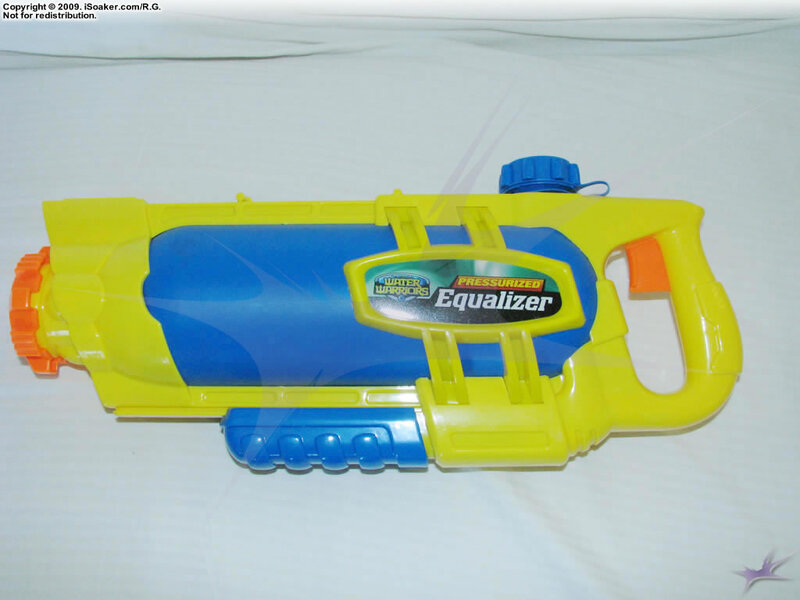 If anything, the layout of the Equalizer looks akin to the 2004 Super Soaker Vaporizer, a pump-action water blaster, except that what appears like a trigger is peeking out from behind the packaging. However, looking at another angle, one of the unique features of the Equalizer’s packaging is the hole at the rear-side of the water blaster, allowing one to grab onto and feel the sculpt of the rear-positioned trigger-grip area. Most importantly, the rear-trigger grip area has a functioning trigger. 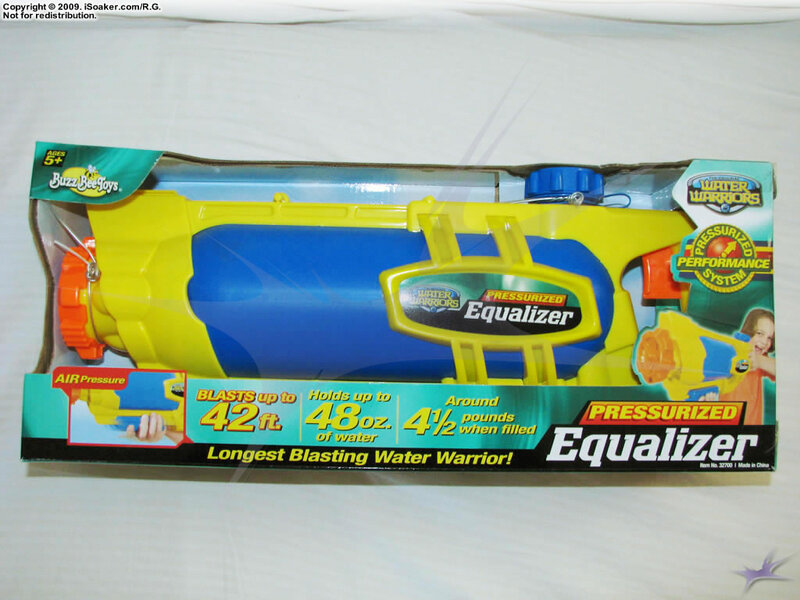 The Equalizer, as its label states, is a Pressurized water blaster! Additionally, from this angle, the bottom-mounted pump comes into view, but remains impossible to access properly while the Equalizer is in its packaging. Behold, the beautiful simplicity of the Water Warriors Equalizer. Looking like 80%-90% reservoir with a nozzle stuck on the front, a pump stuck on the bottom, a trigger on the back, and a fill cap on the top, pretty much every cubic inch of this water blaster is used for something. The rear positioning of the trigger/grip area undoubtedly make this blaster front-heavy, but many fully grown individuals can still use this single-handedly once pressurized, albeit with slightly poorer aim than when using both hands. The rear-position of the trigger and the near bottom-middle position of the trigger do mean that the Equalizer is meant to be used primarily with both hands. However, what older users may find as a negative, younger used find very beneficial since the Equalizer naturally ends up cradled by the User’s arms making the weight of the fully loaded blaster easier to hold for younger warriors typically unable to carry other blasters that hold this much water. Total capacity is around 1.4L (~46.6fl.oz. ), but actual recommended capacity is a little less. A properly filled Equalizer (~2/3 to 3/4 full) can be fully pumped and pressurized and operate continuously above ~80% performance without needing to be pumped again. Granted, pumping in more air in-between shots offers more consistent performance, but it is nice to know that it is not an absolute necessity in the heat of a battle. Pumping, nevertheless, is smooth, easy, and secure, particularly since this pump is almost completely tracked. The front of the pump-grip does extend slightly beyond the body of the blaster when the pump is fully extended. The Equalizer’s nozzle produces smooth, potent streams. 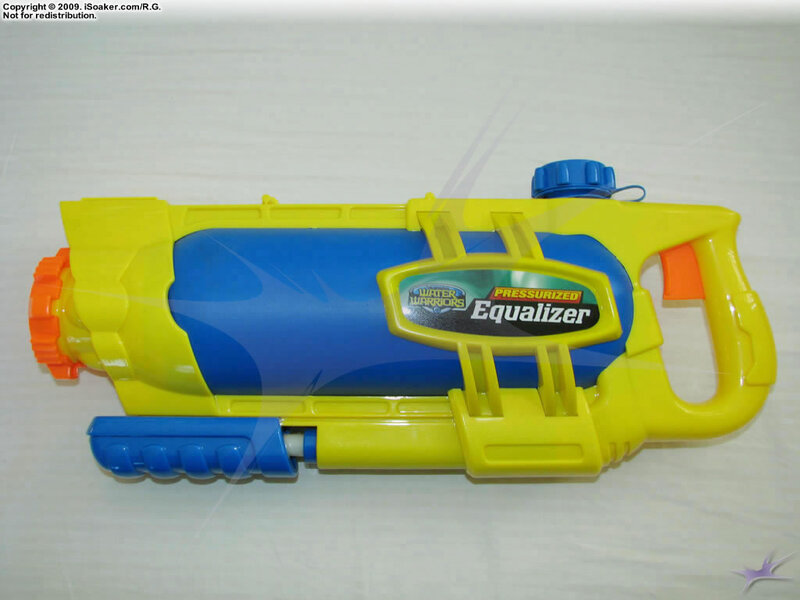 Pushing out nearly a 2x-rated stream, the Equalizer makes streams akin to the Classic Super Soaker XP 150. Streams are unleashed with the smooth pull of its rear-mounted trigger. Given that the Equalizer appears to be all tank between the nozzle and trigger-grip area, the inner beauty of its design is hinted at when looking at the opening to the reservoir from the fill cap. Positioned nearly at the center of this picture, a blue indent partly blocking the reservoir’s opening can be seen. On the outside of this indented region, but within the yellow body shell, the trigger wire runs from the rear trigger to the front-positioned nozzle valve. (Note: pictures of a Water Warriors Vindicator’s internals show off this feature more clearly. 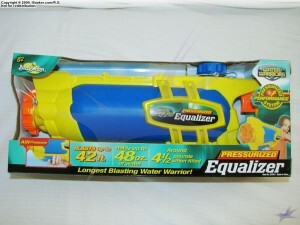 A Water Warriors Equalizer was not opened at iSoaker.com). The reservoir cap, itself, is well-made with a rubber O-ring seal as well as a rubber inlet valve to allow air in while preventing water from leaking out. 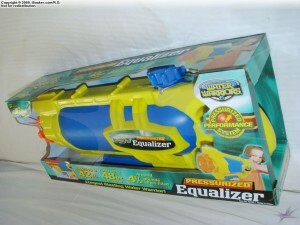 Ultimately, how good a water blaster feels and performs is what counts and the Equalizer does it well. Being pretty much nozzle, trigger, pump, and tank, the Equalizer makes the most efficient use of its size for its reservoir space, but its linear design offers solid stream performance as well. While some may not like the rear-positioning of the trigger (making it more necessary to wield this water blaster with both hands), older, stronger users should still be able to use this single-handedly while younger users do tend to like the rear-trigger position, cradling the Equalizer and happily blasting away. The choice for using pressurized reservoir technology makes sense for a blaster of this size and, when properly filled and pressurized, the Equalizer will continue to produce solid streams above 80% of its maximum potential without needing to be re-pumped! Though first released back in 2009, variants of the Water Warriors Equalizer have been produced ever since, namely the Water Warriors Ultimate Outlaw (2011) and the Water Warriors Outlaw (2013). 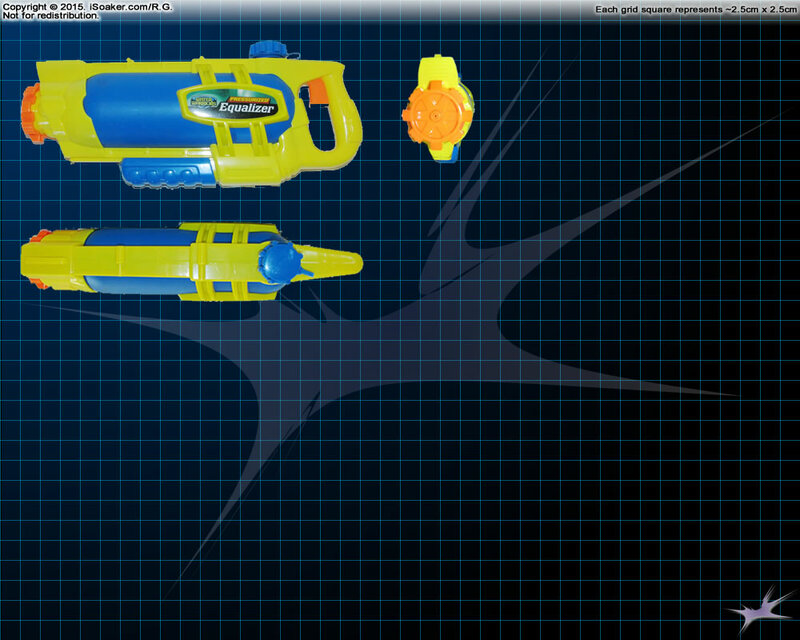 The Water Warriors Equalizer marked the beginning of a series of successful Water Warriors water blaster models. 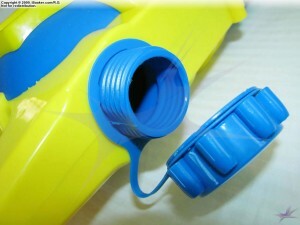 Its no-nonsense, solid design reflects the fact this water blaster is about capacity and performance, not gimmicks. Though the range measured on the Equalizer tested at iSoaker.com was a little shorter than reported on its packaging, use of subsequent models has yielded streams appearing to surpass the 40′ mark, though not accurately measured. In the end, the Water Warriors Equalizer makes for a great pressurized water blaster, able to be used by younger and older users. While younger users may need help fully pressurizing it, once primed, the Water Warriors Equalizer can keep the pressure on until it is out of juice. 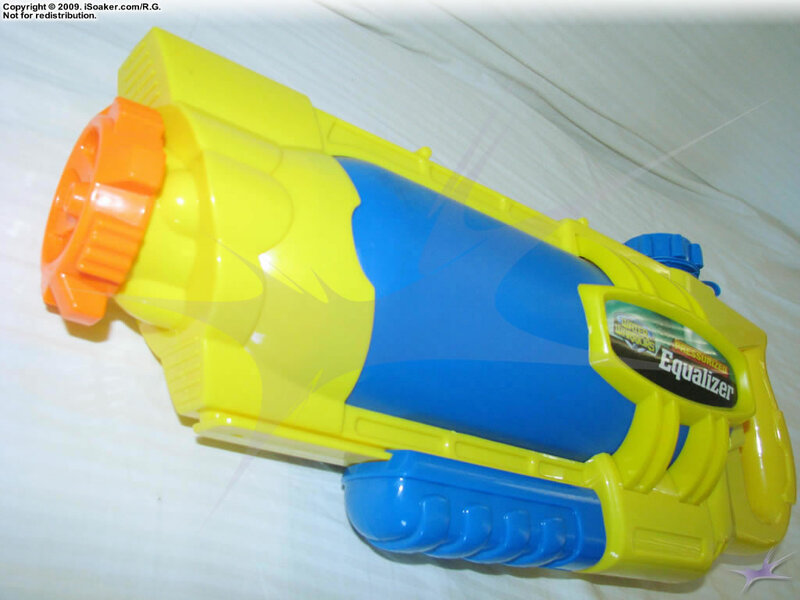 While outclassed by significantly larger air pressure and elastic-based water blasters, Water Warriors Equalizer Users will still make any smart opponent think again; few would be able to challenge this water blaster without being soaked as well. good design, nice stats. I want to get this gun but it is producted in 2009.. where can I buy it from? The Water Warriors Outlaw http://isoaker.com/Armoury/Analysis/2013/water_warriors_outlaw.php is what you’ll find in stores in North America these days. Not sure where you can find it in Korea, though.